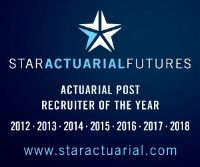 A leading consulting firm is looking for experienced Non-Life actuaries to join their team in London. The ideal candidate will be qualified or very close to qualifying, have experience in direct insurance or consulting and have a broad range of skills. Expertise in core actuarial areas of capital modelling (particularly Igloo), reserving, Solvency II and pricing will all be considered. Strong communications, client-facing skills and managerial skills will all be extremely useful in addition to technical proficiency. This is an excellent opportunity to work across a range of diverse actuarial projects and it is also a chance to engage with a number of different client types.